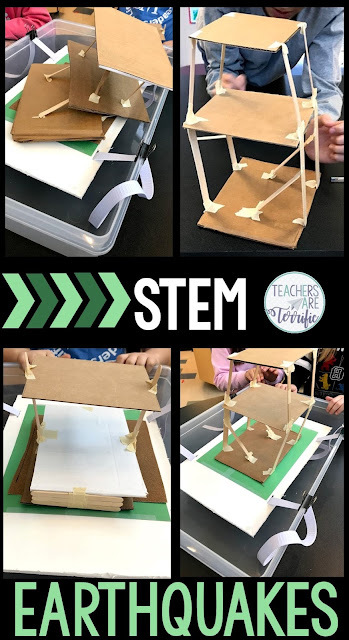 Do you have favorite STEM Challenges? We sure do! We love the Roller Coaster Challenge and the Pancake Challenge. But we also love the three challenges that created the Earth Series bundle. This post will focus on only the Earthquake Structures. The other two challenges in the Earth Series will be featured soon! Trust me! Your kids will love these three challenges, too! I made several pans of jello because I thought it would be great if several teams could test their earthquake resistant structures at the same time. But, it turned out that one pan was enough. I bought the pans and jello at the Dollar Tree and stored them from day to day in a mini fridge in my lab. We placed a piece of waxed paper over the gelatin because placing those structures right on the gelatin surface did not work. The cardboard tended to stick and when you lifted the structure out it would leave holes and also made the cardboard wet. The structures were made from toothpicks and mini marshmallows. I know that also sounds like it would be bad, but it is really okay - IF you have marshmallow rules and toothpick rules. Do not pull the marshmallow apart. It must be used whole. If you need a hole in the cardboard for the toothpick, use tools. Do not attempt to pierce the cardboard with the toothpick. I used the point of a compass to make toothpick holes. Kids just marked the spots and I pierced the cardboard for them. Most of my rules deal with safety, but others are rules because kids can get really silly- especially with gooey marshmallows. After the structures were built the kids tried them on the shake pan. A lot of our structures stayed together really well, while others totally collapsed. This is a video using the gelatin pans that we had fun with! So, we recently tried this challenge again! 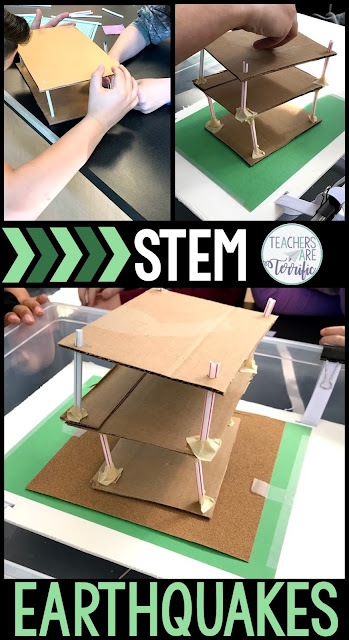 I love to try new things so I completely experimented with this Earthquake Challenge. First, we tried a new shake table! So, this year I decided to try something different for our shake tray. We loved the jello pans, but what if I could engineer something that would work just as well. BAM! Here's what you need. This will take you about 3 minutes to make! Check the photos above. Cut the foam board so that it fits inside your bin with enough room to move in all directions. Use a box cutter to cut slits into four spots on the foam board. I measured and placed these evenly and cut long slits instead of large holes. Thread the elastic or ribbon through the slits. Use the binder clips to attach the elastic or ribbon to the plastic bin. The elastic can be adjusted to make it tighter or looser to change the way the shaking works. Looser means more shaking! It's that simple! We did discover that the houses would slide on the foam board so I taped a piece of sandpaper to the top of the foam board. It helped with the sliding! Like I said, I love to try challenges in a different way. So, in addition to the new shake tray, we also tried the same materials and a variety of new ones. First, we tried the marshmallows and toothpicks again. These two materials work well and kids really like the uniqueness of food as a building tool. In the photos above you can see some of our creative structures and the new tray being used. Hmmmmm.... what else can we try? The first new materials we tried were craft sticks and tape. I knew this would work, but I wanted to add something to the challenge to make it challenging. So, I limited the tape severely. As you can see from the above photos we had mixed results. Some structures worked very well and would not collapse, while others toppled. The next class used straws and tape. Again, I limited the tape so the kids would really have to think. By the way, do you know how hard it is to tape straws to cardboard? Yes, I made some videos of our great and not-so-great models with the new shake tray! Take a look! If you can make a hole in the cardboard, craft sticks and straws work really well. If the teacher says you cannot make holes, then you have to get creative. The shake tray was excellent. We did find that the structures would slide too much without toppling. So, we tried putting a tape roll under the structure to hold it in place. Some of them toppled anyway. The tape just kept them from sliding around. I loved all three ways we tried this challenge. If you already own this resource from my Teachers Pay Teachers store go and redownload it! I added a much-updated version with photos and materials lists for all the new ways we tried this challenge. Kids love this one and you will too! Just in time! I was looking for a way to make a better shake table. I really liked the Jello idea but didn't have a good place to store them. Thanks for the idea and now I have to go download the newer version. Yay! I am so glad you saw this post and can grab the updated version of the resource! We loved all the different ways we tried these structures and the new shake tray worked very well! Thanks!